However, it may be a particularly suitable F3F model for beginners also. For this task we offer the 2M version which has a lighter weight laminate carbon which permits weight savings. Despite of its fast plane character, it has a docile flight which is of great interest for beginners. However the Vector DS can carry 900gr of ballast which allows it to penetrate in the days of strong wind, or crosswind conditions. It is built entirely of carbon fiber and kevlar. The wings are composed by a core of foam with carbon skins. Such skins overlap in the leading edge, producing structure very strong and resistant to the hits of sticks and stones. 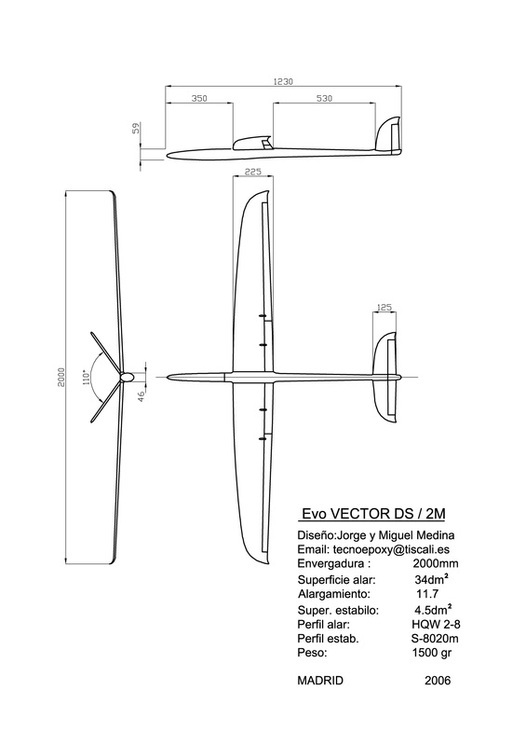 The Vector DS is an all terrain plane which is ideal for bad slopes or small ones. Fast, Fun, and very transportable, the Vector DS is a great plane for taking in the car always.